Billy Ray Lopez is the first University of La Verne student to receive a scholarship from the Southern California Sports Broadcasters Association. The $2,500 scholarship was presented to Lopez during the organization’s annual Hall of Fame Banquet on Jan. 28 and will be applied toward his 2019-2020 tuition. 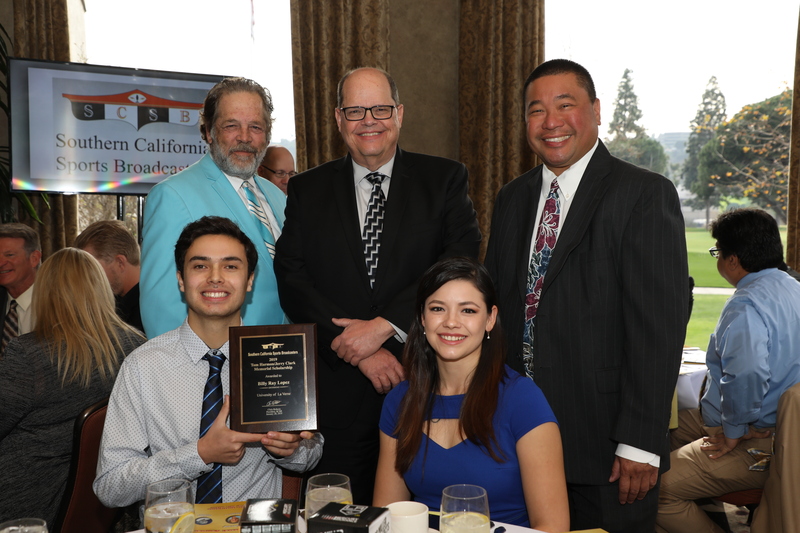 The scholarship is given once a year by the Southern California Sports Broadcasters organization. The honor student is a double major in broadcast television and political science. He has announced more than 50 football, baseball, softball, basketball, and soccer games on KWST, LVTV, and LeoFM. LVTV and LeoFM are student-run stations at the University of La Verne. He also coaches the San Dimas High School boy’s freshman basketball team. During the ceremony, Anne Meyers Drysdale was inducted into the Hall of Fame along with her late husband, baseball great Don Drysdale. She is the first female broadcaster to be inducted. She joins University of La Verne alumni Rob Fukuzaki ’88, who was inducted in 2016. Communications professor Don Pollock nominated Lopez for the scholarship. After college, Lopez hopes to pursue his master’s degree in social justice and theology. During that time, his plan is to keep broadcasting games, hopefully with the Rancho Cucamonga Quakes baseball team. The University of La Verne Communications Department is among the best in the state of California in educating future media professionals. Students learn in a hands-on training environment designed for radio and television. For more information on the Communications Department, visit artsci.laverne.edu/communications.